We have been discussing what Ikebana is. One of the interesting questions was why ikebana has become Ikebana. 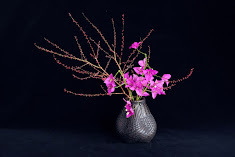 In other words, why ikebana, a specific style of Ikebana has become a general term for Japanese flower arrangement. Originally it was just a reaction against the authoritative styles such as Tatahena and Rikka. While I was reading an article by Dr Inoue, some ideas came to my mind. One of the interesting findings in his article is that there was a big dispute over ikebana in Japanese history. Rikka masters (Ikenobo school), ikebana masters (other ikebana schools) and tea masters were all arguing that ikebana belongs to them but not to others. Even though ikebana was counter cultural, probably it was so popular that everybody wanted it. Because it was so popular, ikebana has become Ikebana, a general term. That is a quite convincing hypothesis but now we have to ask a more important question: why was ikebana so popular? It might have something special that Tatehana or Rikka did not have. That might be something to do with the essence of Ikebana. We have to think more about the nature of ikebana. This is a sample of a small arrangement of our home party package, which consists of a small arrangement, table arrangement and medium arrangement. Using my client’s colorful container, I chose to use rather simple and clean combination of white and green. I am going to teach “Japanese Aesthetics: From Ikebana to Contemporary Art” at RMIT University from October this year. Please check the details. Reference: Inoue, Osamu (2011). Chabana and Nageirebana in the early modern times: Their differences and similarities.